Yesterday , a private investigator in the Seth Rich murder case hired by the family of the slain DNC staffer filed a lawsuit against Fox5 news and GOP financier Ed Butowsky for misrepresenting statements he made in order to”shift the blame from Russia and help put to bed speculation that President Trump colluded with Russia…” because “that is the way the President wanted the article,” the suit alleges. The plaintiff, former D.C. Police detective Rod Wheeler, also asserts that the Trump administration was directly involved with the story. Butowsky, who paid for Wheeler’s investigation on behalf of the Rich family, arranged a sit-down meeting with former Press Secretary Sean Spicer to brief him on Wheeler’s findings. While Spicer acknowledges the meeting, he told NPR that he only agreed to it as a favor, and he wasn't aware of any Trump involvement in the Fox5 article. Butowsky later boasted to Wheeler that President Trump had personally reviewed the Fox story prior to publication – a statement he now says was a joke. 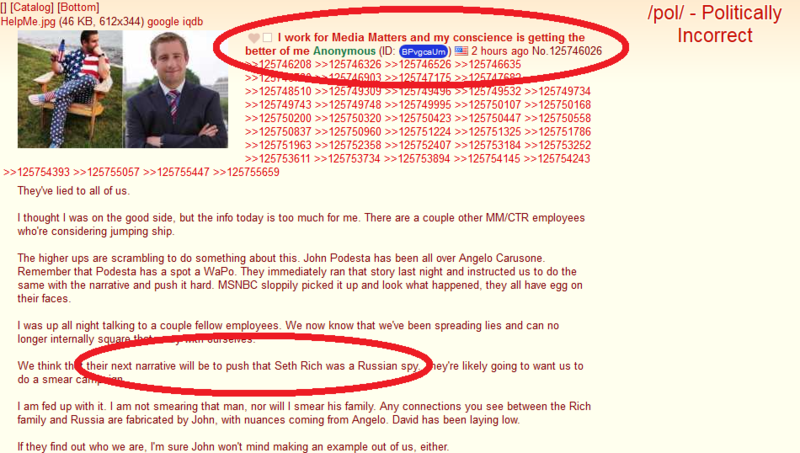 Regardless of the other elements in the lawsuit, Rod Wheeler’s findings are on record: Seth Rich directly communicated with WikiLeaks – which, if true, destroys the Russian hacking narrative (notwithstanding any new attempts to smear Seth Rich as a traitor who worked with the Russians). While Hersh told NPR on Monday that Butowsky’s claims of an FBI report hold no water, Butowsky taped their conversation – as profanity-laced leaked audio, reported Tuesday by Cassandra Fairbanks of Big League Politics, confirms that according to Hersh, Seth Rich contacted Wikileaks. Hersh also told Butowsky that the DNC made up the Russian hacking story as a disinformation campaign – directly pointing a finger at former CIA director John Brennan as the architect. I have a narrative of how that whole thing began. It’s a Brennan operation, it was an American disinformation, and the President, at one point, they even started telling the press – they were backfeeding the Press, the head of the NSA was going and telling the press, Rogers, was telling the press that we even know who in the Russian military intelligence service leaked it. And with that, Rod Wheeler and Seymour Hersh – in their own words, all but confirmed that Seth Rich directly provided Wikileaks with the emails which were leaked during the election. Moreover, and this can’t be overlooked – Hersh accused the Obama administration, and John Brennan in particular, of fabricating the Russia narrative. A senior House Democratic aide confirmed Awan was still employed by Wasserman Schultz as of Tuesday morning.